Bittersweet comes in two major varieties: American and Oriental. 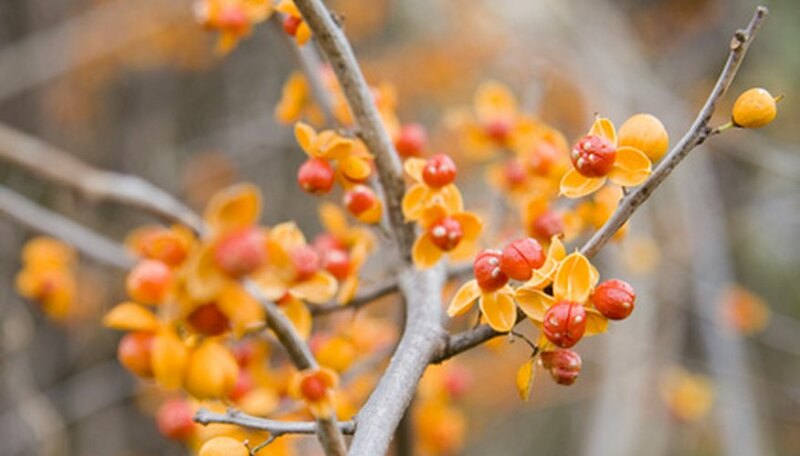 Oriental bittersweet is considered invasive in most states and will grow out of bounds. American bittersweet is vigorous, climbing everything in its path, but not invasive. Bittersweet is a dioecious vine, which means it needs both a male and a female plant to produce seed. Knowledge of how to harvest and care for this seed will help you grow a healthy bittersweet vine. Pluck the ripe red berries off the bittersweet vine when the yellow capsules surrounding them break open. The time for harvest will fall between mid-September and November. Lay the berries out at room temperature for two to three weeks to dry. When they seem shriveled and dried, remove the outer red berry covering and dry the seeds for another week. Place some peat or sand in a resealable plastic bag and moisten it slightly. Put the seeds in this moistened medium and place the bag in the refrigerator for three months with the temperature between 34 and 41 degrees F. This cold period will help the seeds germinate. Plant the bittersweet seeds 1/4 to 1/2 inch deep in well-drained soil. Bittersweet will grow vigorously in almost any soil type. It will also grow in both full sun and full shade, but needs sun for fruit production. Space multiple plants 12 to 36 inches apart. Make sure they have some kind of support to climb. Water the bittersweet seeds, keeping them moist until they start to grow. After this point, these plants need little care other than pruning. Annual pruning will keep them from strangling other plants and growing out of bounds.